I haven't seen a whole lot of bloggers talk about this, but there are days in which I wonder why I keep doing all this at all. 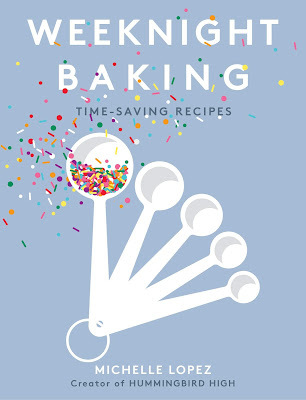 Although I still enjoy baking (and occasionally, the photography, but admittedly less so these days on account of my cookbook — but more on that in another post, I guess), my numbers are stagnant. My monthly traffic reports and social media numbers basically stay the same month over month. I appreciate the core group of audience that I have, but frankly, stagnant numbers don't look great from a brand/sponsorship perspective. Numbers are unfortunately something I have to keep growing, given that this is where the majority of my income now comes from. But with so many more bloggers and Instagrammers joining the game, it's harder and harder to get and stay noticed. There's a lot of *content* out there, everywhere, all the time. And with the Instagram algorithm being what it is, people are more discerning about which accounts they follow and unfollow. As somebody who uses Instagram primarily for business purposes (to keep up with my peers, to find inspiration for my own work), I 100% get it — it can be frustrating when the algorithm serves you the content that they think you want to see, but ends up being completely off the mark most of the time. And for some reason, it's usually the same few accounts they keep serving up. Thus, the unfollowing. I always thought that the following and unfollowing was something that was just part of the game, but it seems that everybody takes it personally (even just a little bit). Because it happens to me on such a mass scale (Seriously — for every few followers I gain, I lose twice as much. I 100% don't know why, and have given up on trying to figure it out), I've become somewhat desensitized to it. I just figure it's a combination of everybody being frustrated with the algorithm and being flooded with all sorts of content all the time. It's annoying from a business perspective, sure, but unless it's a good friend of mine, I won't lose any sleep over it. But I have friends (bloggers and non-blogger alike) who really, truly agonize over their unfollows, even going so far as to download apps that track such activity or check SocialBlade everyday. It scares me to see how much they take it personally — smart, rational people whose self-esteem has been crushed by a social media app. But I'm not here to judge, because I actually get it. It stings to have folks unfollow you. I don't know what the solution to any of this is, except maybe to just keep my head down and focus on my baking. But I'm not going to lie — there are some days when that's a drag too. Developing recipes for a cookbook is a beast, and I spend most of my days making the same recipe eight or so times to really, truly hone it to perfection. After days (and weeks) like that, the last thing I want to do is do the same but for my blog instead. So I'm trying to give myself a little bit more breathing room, and pick recipes that are more low-key and fun for Hummingbird High. Like this cake! This is the Happy Wife, Happy Life dump-it chocolate cake adapted from Small Victories. It's a one bowl recipe where there's no need to cream the butter, sugar, and eggs — hence the name "dump-it", I guess, because you literally just dump all the ingredients into a bowl and mix. As a result, it's a bit denser and flatter than most chocolate cakes, but plenty tasty still (it actually reminded me of a Little Debbie Cosmic Brownie, if that's your jam). I also had a bunch of Ghirardelli Double Chocolate Brownie box mixes left over from when I was reverse-engineering a box mix brownie recipe for Weeknight Baking, so I decided to bake a mix in a cake pan to use as the middle layer for this cake. The brownie layer added extra height and decadence, and worked really well with the lighter-yet-still-dense chocolate cake layers. I foisted this cake off to my friends Kyle, Jenny, and Pech, all of whom came back with rave reviews (well, except for Kyle, said that my frosting job looked like something a kid would make but then ate the majority of the cake so ¯\_(ツ)_/¯). Because there are a lot of components to this cake, the best way to make it is to break the work up over a few days. First, make the box mix brownie layer on Day 1. I used a Ghirardelli Double Chocolate Brownie box mix, which makes an 8 x 8-inch brownie. I baked it in an 8-inch round cake pan, upping the baking time for about 5 to 10 minutes than what's suggested for an 8 x 8-inch brownie. 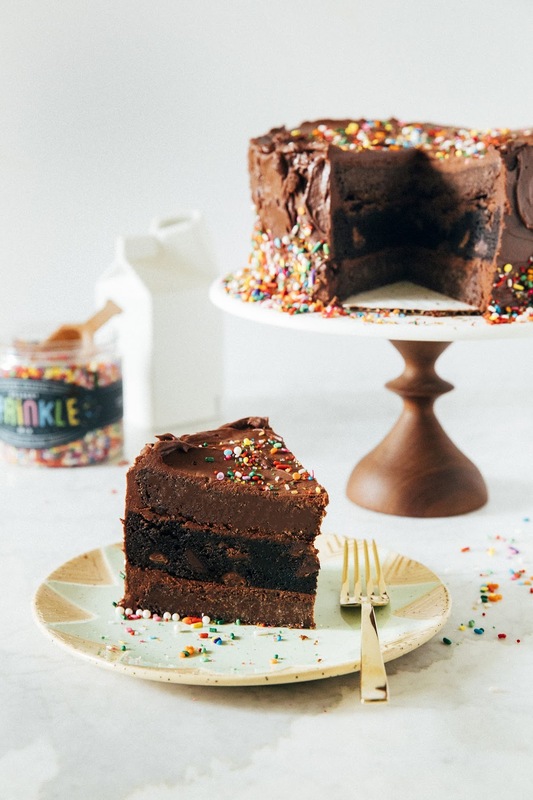 You can totally make this with another brownie mix brand, but watch out for its yield — most box mixes make 9 x 13-inch brownies. If you go this route, you'll need to bake the mix in two 8-inch pans instead (and end up with a quadruple layer cake). Allow the brownie to cool to room temperature completely before turning out of the pan and wrapping fully in plastic wrap. Well wrapped, the brownie layer will keep at room temperature for a few days — you can make the chocolate cake and frosting then! This is one of those rare recipes on my blog where it's incredibly important that all the ingredients are at room temperature. Because you won't be using a mixer for the chocolate cake, it can be hard for the ingredients to incorporate together when mixing by hand. 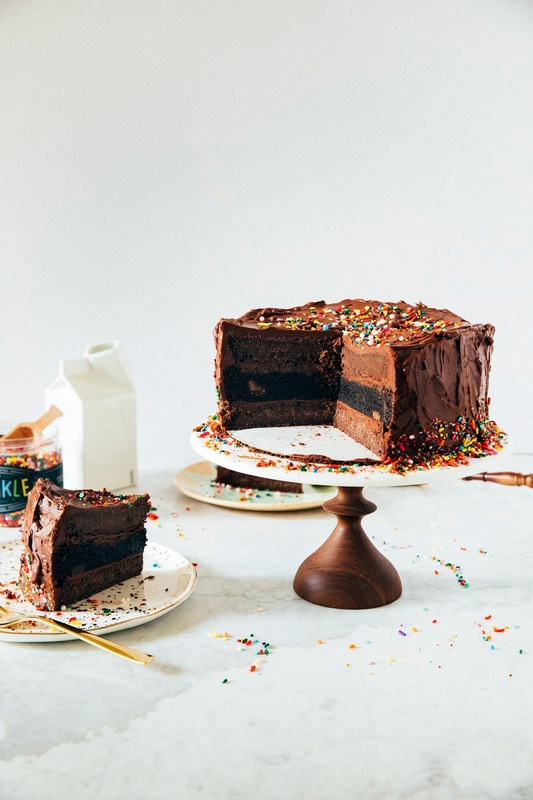 If some of the ingredients are cooler than others, there's a possibility that they'll separate during the baking process and you'll end up with a weirdly textured cake. Bring all your ingredients to room temperature first! Center a rack in the oven and preheat to 350 (F). 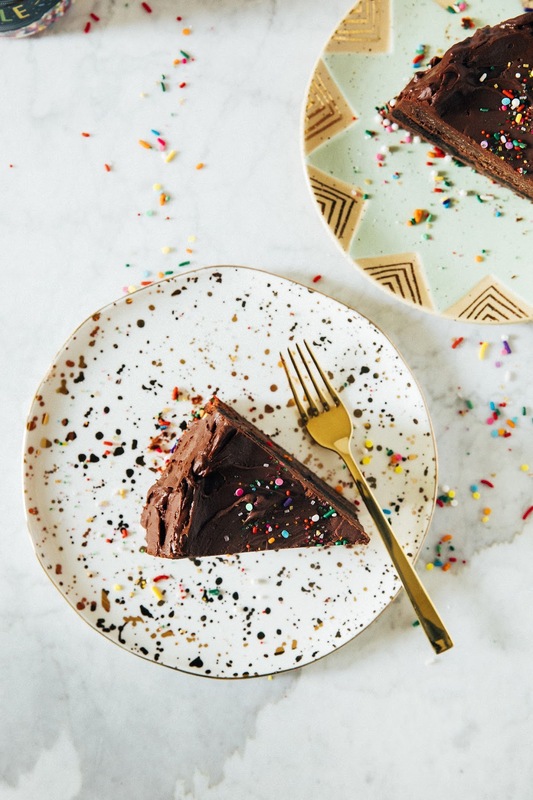 Prepare two 8-inch cake pans by spraying generously with cooking spray and lining the bottom of each pan with a parchment paper circle; spray the parchment paper as well and set aside. In a large bowl, whisk together 1 1/4 cups all-purpose flour, 1 cup granulated sugar, 3/4 cup Dutch-processed cocoa powder, 1 teaspoon baking powder, 1 teaspoon baking soda, and 1/2 teaspoon kosher salt until combined. Add 1 cup melted butter, 2 large eggs, 1 cup buttermilk, 1 cup coffee, and 1 teaspoon pure vanilla extract and continue whisking until the batter is smooth. 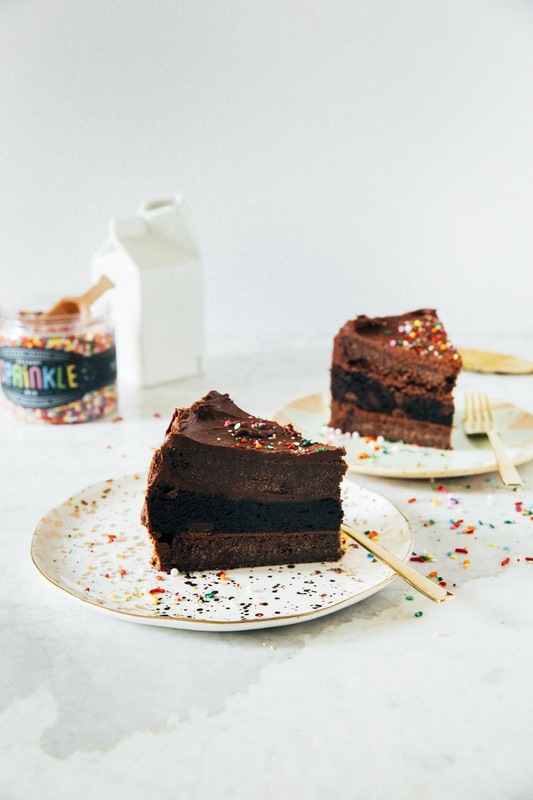 Divide the batter evenly the two prepared cake pans and transfer to the preheated oven to bake for 30 minutes, or until the top of the cakes bounce back when gently poked and a skewer inserted into the center of each cake comes out with few crumbs. Transfer to a wire rack and let the cakes cool in their pans to room temperature completely before frosting. Once the cakes and brownie have cooled to room temperature and you're ready to frost the cakes, make the frosting. Place 9 ounces roughly chopped dark chocolate in a medium, heatproof bowl. Nestle the bowl on top of a saucepan filled with 1 to 2-inches of water, ensuring that the bottom of the bowl does not touch the water. Place the saucepan over medium heat. Use a heatproof rubber spatula to stir the chocolate occasionally to melt. Once the chocolate is melted, transfer the bowl to a wire rack and immediately whisk in 1 1/2 cups sour cream and 2 tablespoons maple syrup. Leave the mixture on the wire rack to cool; as it cools, it will slowly solidify and become spreadable. 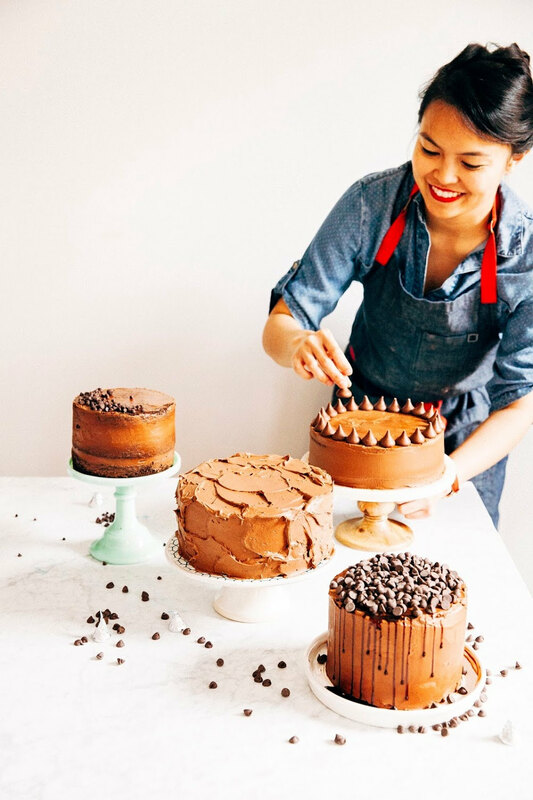 Select one of the chocolate cake layers as the base of your cake and use an offset spatula to spread about 6 tablespoons of the frosting on top of the cake. Carefully transfer the brownie layer on top of the frosting Spread another 6 tablespoons on top of the brownie and top the frosting with the remaining chocolate cake layer. 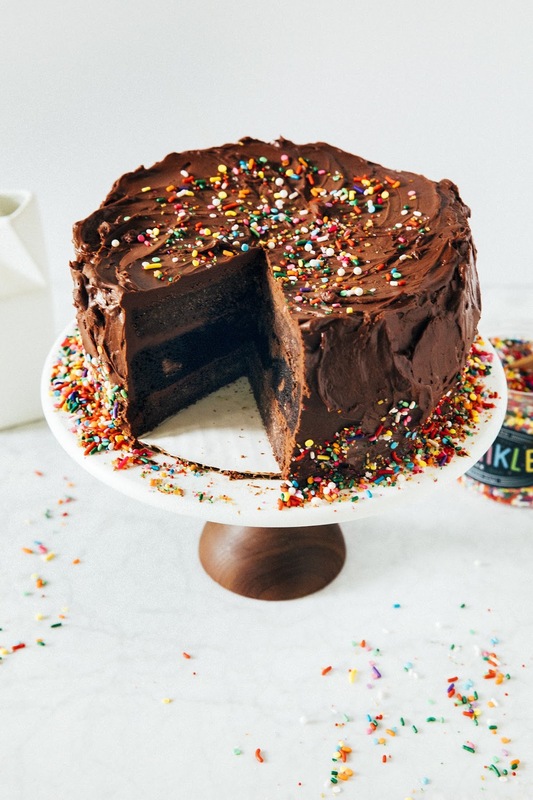 Cover the cake completely with the remaining frosting and garnish with sprinkles.